This article is the second article in this series. The first, “Why Process Sounds Stupid” was published by BPM Institute in May, 2011.These two articles look at organizational culture and three strategies to become a more process oriented organization. Process maturity assessment has become popular in the last few years, as companies want to understand their current level of maturity and what it entails to get to the next level. But once you assess where you are on a process maturity scale, what kind of approach is best for your organization – top-down, middle-out, or bottoms-up? How would you know, what steps should you take, and what challenges might you anticipate? For this discussion, I will use the Capability Maturity Model Integration developed by Software Engineering Institute at Carnegie Mellon. Below is a picture of the model with simple descriptors to distinguish each level. There are other models available, but whatever model you use, you are still facing the question of how do I move the organization along. There are several common elements that are relevant to each maturity level; I have created the following graphic to depict these common elements. Process is at the center of the model: it represents the workflow and information flow in the organization. Business Integration and Leadership provide input and structure to process selection, improvement and monitoring. Processes provide information for Data and Learning. Processes also provide outputs that contribute to organizational results. The arrows indicate how each element impacts another element. How would each strategy work at process levels 1, 2, or 3? Leadership: Executives or leaders get excited about process improvement and decide to make process improvement an important initiative for the company. They take an orientation to process improvement and how it can help the company. Business Integration: Executives begin with communication across the company about the forthcoming initiative. Processes: Executives designate a small internal process improvement staff group who starts to map current processes from the top down. They also choose a software application to use to model the processes (possibly a BPM suite, but it could be an application like Visio or Aris). They begin to make a comprehensive categorization of company processes. Process Owners are named as processes are modeled. Learning: The organization provides training in process improvement concepts from a reputable firm for employees en masse. Data: There is limited data gathering at this point. What are the advantages and challenges of the Top-Down approach? Advantages — A clear statement from executives is a powerful beginning. Training to large numbers of employees begins to build common understanding and nomenclature. A full list of key processes and their documentation gives a comprehensive perspective. Challenges — This process can take a long time with very little business result. Often there are many activities but not much return from actually analyzing and improving processes. Although processes have process owners, their role and their authority are unclear. Typically process owners are not leading any improvement efforts. Training provides concepts and tools, but these are not yet applied to real work. Sometimes managers and employees just get tired of doing this work and not seeing any change. Leadership: Managers in specific departments who are early process adopters lead the charge. They select processes in their departments and engage their employees in the process improvement efforts. These managers are actively involved in the process improvement efforts. They are strong advocates to other colleagues of their improvement efforts and results. 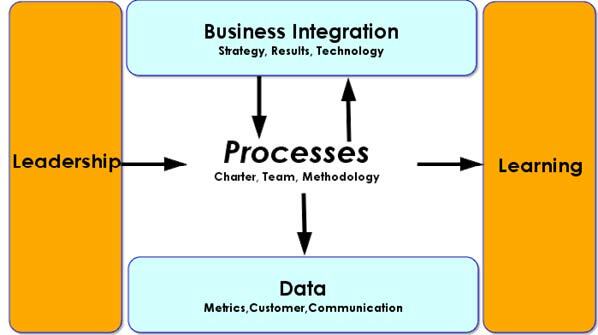 Business Integration: Managers pick processes that need fixing in their own area and that employees want to fix as well. Their department benefits from the improved results. Processes: Have a narrow breadth, often within the department. Improvements are suggested and implemented under the manager’s authority. Learning: Managers get their own training to lead these efforts. They have participated in process improvement training by a vendor, internal company training, or they may use a consultant as a coach. Employees learn from the manager or similar training as well. Data: The manager “knows” what the problem is so will probably not feel the need to collect baseline measures or get customer feedback. After a process is improved the team promotes their results, but again they have limited quantitative data to show the level of change. What are the advantages and challenges of the Bottoms-Up approach? Advantages — The bottoms-up effort just needs a single manager, a process and a team to get started, so start up effort is minimal. Efforts can be quite focused—on specific defects, at a customer touch point, or a full process. Business improvements start happening in the work place. Employees and leaders are learning and applying principles and tools to real work examples. Challenges — Smaller improvements may be contained and not widespread. There is no enterprise strategy for a process focus, so the initial improvement efforts do not have a big impact on the corporation as a whole. This effort can spread virally, but if may also die with just a few early adopter groups. Leaders may not have the ability and resources to influence and implement projects outside their departments. Leadership: Executives or managers in specific divisions or functions select the processes to work on based on real needs in their divisions, choose team members, and provide the time and budget to do the work. These executives or managers are active sponsors for the process improvement efforts they select. This is similar to leadership in the bottoms-up effort but at a higher level in the organization. Business Integration: The executive or division leader identifies key improvement goals for the processes, in alignment with their strategy and company goals. Processes: The processes have a breadth relative to the size and scope of the executive’s authority, but their span is larger than in bottoms-up. Usually the process will be entirely within the executive’s span of control, but it could also include other departments that are key contributors before or within the process. Two executives may choose to lead this effort if a process spans two areas of authority. Teams for each process include subject matter experts for all elements in the process, no matter what department they come from. Learning: The executive or manager hires a consultant to assist him/her and the teams. Unlike the bottoms-up approach the leader is unlikely to do all the work himself. The company’s learning and development department can also provide just-in-time training to teams as they have projects. Team members learn process skills while doing the work and often see the process from endto-end for the first time. Data: The team gathers internal baseline measures as well as customer feedback for the process. After a process is improved the team measures again to determine the impact of the improvements. Benchmarking is often part of the process. What are the advantages and challenges of the Middle-Out approach? Advantages — The biggest advantage of this approach is that real work is being done to improve processes that are important to the executive sponsors, and secondarily to the enterprise. With processes of wider span the opportunity for larger results is much greater than in bottoms-up. Employees and managers are learning from doing, as with bottoms-up. Implementation is successful because all involved want to make it happen. Challenges — The processes that division leaders select are important to them but they may not be the highest priority for the organization. In fact improvements in one area might have a negative impact on another area. In other words, the organization is not looking at its processes fully from end to end. But it has taken good initial steps. Which Way Should Our Organization Go? The question really is — where are you now, and how do you move up the maturity level? More importantly, would moving up a step on the maturity scale result in improved performance or profitability? John Alden (who developed another process maturity for the Object Management Group) says that moving up the maturity scale does not guarantee an increase in business performance, but these elements are inter-dependent. 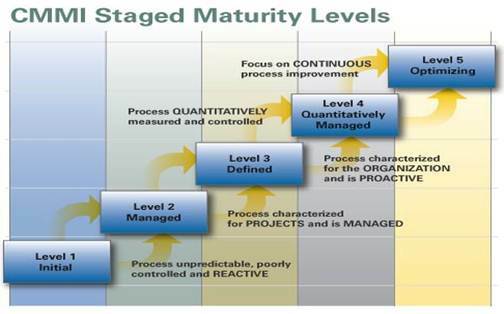 Identify the organization CMMI process maturity level. Find some appropriate early adopters — probably division leaders and process subject matter experts for middle-out improvement projects or supervisors and their employees for bottoms-up projects. Define success for those projects — from a business and capability perspective — so you can measure your work against the organization’s goals, improvement targets and metrics. Get started and manage to the challenges that you can expect paying close attention to the qualitative and quantitative data you receive. 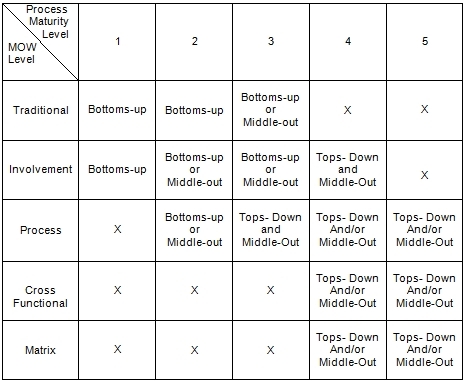 The table below lays out the best approaches for Management of Work (MOW) level and each process maturity level. Note that many of the squares in the table are X’ed out. That is because those cells would just not exist. For example, when an organization was at process maturity level 3, 4, or 5 they could not have a Traditional Management-of-Work level. On the other hand, when an organization had a MOW of Matrix they would not be operating at a process maturity level of 1 or 2. Many boxes have two choices. Hence, there is no one right way. Additionally as you move up the maturity levels there needs to be more top down guidance. But not top down guidance like I mentioned earlier in the article when organizations are beginning on this journey. Here top-down would mean alignment with strategy, prioritizing processes based on strategic need, monitoring results at the company level, and resourcing across the enterprise. Data and metrics for processes and comparing processes within the organization becomes critical starting at process maturity level 3. What’s important is that having a good idea, getting executive support and having sufficient budget does not guarantee a successful implementation. Instead, it is critical to pay attention to your culture (exemplified by the management work levels.) Only then can you make a reasoned judgment of how far and how fast you can move the company. If you don’t pay attention to your culture you will most likely fail. So start there, even though you may expect to change the culture over time. Let’s take a few real life examples. Bottoms-Up — A fast growing Fortune 5000 high tech company with a culture of strong involvement and customer responsiveness was at level 1 process maturity. They used a bottoms-up approach in one retail store, selecting a process that was key to sales and customer satisfaction. They mapped the current process and talked with potential customers to understand their need. Then they developed a new process with specific resources targeted at this customer segment. Success spread to other retail stores because of the business results, employee empowerment, and viral communication. Middle-Out — One biopharmaceutical company had a process MOW and was at process maturity level 2. Department managers had the flexibility and autonomy to run their departments as they saw fit. Their executives were strong advocates of a process approach and provided the general direction but did not get directly involved. Because of the cultural elements, they began with choosing less complex processes at departmental level, getting success, and then going to divisional or cross divisional processes. Top-Down — A utility company had strong involvement between employees. They were at level 2 process maturity for the organization and level 3 for some individual processes. They used a top-down approach initially, defining and modeling core process for the enterprise, choosing process owners and executive sponsors over multiple process owners, and a BPM support center of experts. They struggled with how long it took to model As Is processes. They began to make progress when they focused on processes for one early adopter executive sponsor and used a middle-out approach with that person as a leader. The combination of top down and middle out was more successful.